Between 1973 and 1981 Christchurch Transport Board, in New Zealand’s South Island, received 147 Bristol RE chassis, all but one in kit form, and all but two receiving bodies – the remaining two were used for spares. 25 received ECW bodies, shipped out from the UK as kits, 29 ECW “lookalike” bodies from local Bodybuilder Hawke, and 91 Hess bodies assembled to the “Alusuisse” system. 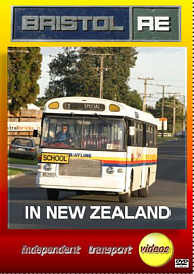 Bus deregulation in New Zealand in 1990 reduced the amount of work undertaken by the Transport Board’s successor company, and the REs were gradually taken out of the fleet, being bought by other operators throughout New Zealand. In the Spring of 2007 probably 50 or so remained in active public service, mostly on North Island and mostly as school buses, even though the newest were more than 25 years old. Filmed in April 2007, this celebration of the New Zealand RE covers the most prolific RE users at the time: Taverner’s of Pukekohe, Murphy’s of Thames and, significantly, the Bayline Group of Tauranga, at the time the latter probably being the largest operator of the Bristol RE in the world. Duration : 70 minutes (approx).